Electronic calendaring systems have transformed our busy lives. But like many other advancements in technology, they are missing interoperability as well as the important human element. Sunday’s New York Times had an interesting article by writer Pamela Paul about a particular group of people that refuse to part with an outdated, inflexible technology in favor of more modern equivalents. I’m talking about the paper organizer. Call it the Filofax, or the Day Runner, the Moleskine or any of these old-fashioned “little black books” that are used to store appointments and business contacts, there still exists a large bunch of folks that utterly swear by these things. I am not one of these people. I’ve never had to use one, and have embraced electronic organization and appointments management as long as I have been professionally employed. But I know quite a few people that are stuck on Day Runners and Filofaxes. And I wouldn’t daretell them to switch to something like Outlook, iCal or Google Calendar because I know exactly what the answer will be. Ex-Engadgeteer Joshua Topolsky has pointed out a number of things which effectively debunk a number of these excuses, most of which I agree with. But as a heavy electronic calendaring/scheduling user myself, I still think there are areas for improvement in electronic calendaring and personal data organization systems. Many of the reasons why I think people stay with outdated technologies such as Day Runners and Filofaxes for organization is that the experience is tactile and/or tangible. People like the feeling of holding the object in their hand and having the ability to use a pen or a pencil and quickly write/erase entries and flip through pages. The interface on a paper organizer is also familiar and comforting, much like paper books are. Sure, e-books are more efficient, are instantaneously available if you want to buy one, and you can hold a massive amount of data on an e-reader device like a Kindle or a tablet computer like an iPad, but as anyone will tell you, the reading experience on a device versus a real book is not the same. And it’s not necessarily superior. Many people have easily transitioned into reading electronic books, and they’ve embraced the convenience of them. But for people who are used to paper calendars and organizers, it’s a much harder sell. Day Runners, Filofaxes and similar products allow people to organize data in a free-form way that makes the most sense to them, whereas electronic calendars require that you adapt to a particular calendaring and contact management system’s user interface, specific quirks and behavior. And let’s not forget to mention that transitioning from one calendaring/contacts management system to a new one can be a bit of a jolt and something of a serious learning curve. I know this because I’ve observed first-hand when people go kicking and screaming from old-school Palm Pilots and ACT! to something else. And God forbid if you are actually forced to use more than one. In my particular case, I have to use two different calendaring/contact management systems. 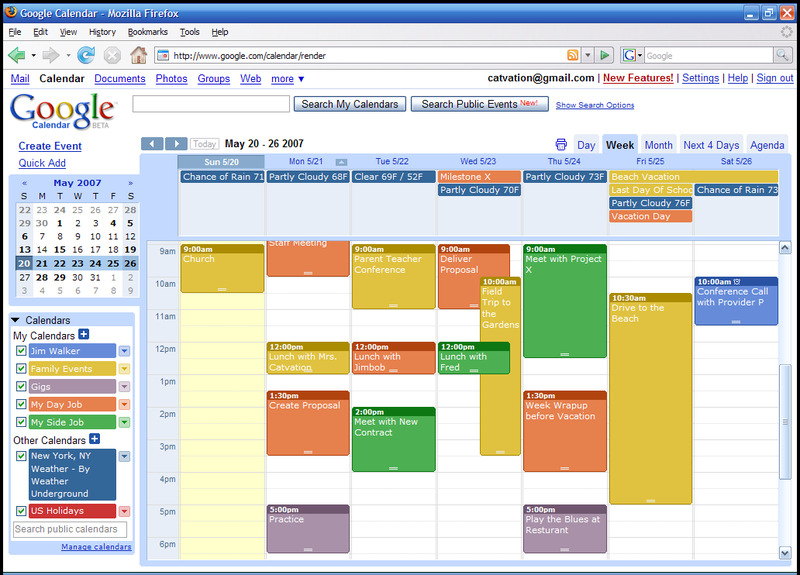 One is my personal Google Calendar, which I can access via GCal’s web interface, or I can link it to any number of my computers and devices, such as via Google’s naive Android application on my Droid smartphone and XOOM tablet device, or iCal on OS X Lion or the iPad using CalDAV or Google Exchange Emulationsynchronization. I can also use any number of 3rd-party programs that try to make the experience more “Native” on the iPad, such as CalenGoo, since iCal’s Google Calendar implementation on iOS is pretty weak. The second calendar I have to use is IBM Lotus Notes. This one is managed by my corporate email/contacts/calendaring software that runs on my work PC and periodically replicates itself so that it can work offline. The Domino server it connects to sits behind my corporate VPN, and it has absolutely no knowledge of my Google Calendar and vice-versa. I also can get to it via iNotes, a web interface on my tablets and smartphone, but it requires network connectivity in order to function. I used to have a corporate BlackBerry which allowed me to use Google Sync to populate across calendars, but since I’ve been Berry-free for about two years, activities and contacts across my personal life and my business life have been completely segregated. This is a bit of a problem because I’ve delegated my Google Calendar to my wife, who books things like dinner arrangements and weekend/family activities on my behalf. However, when she does this, there’s no way for her to determine if I have time blocked off in Lotus Notes, because she doesn’t have access to it. Instead, we have to do this the old fashioned way. She hollers at me via email or IM to see if I have the time blocked off. Of course, even if I’ve told her the time is free, there’s no guarantee it’s going to stay free, and I may not be diligent enough to tell her my schedule has changed. It’s a mess because Notes can’t automatically populate a change in Google Calendar. And then if I want to organize other sorts of unstructured data I have to use other programs like Evernote, which I haven’t had the discipline to fully exploit, although the software seems compelling. However, I shudder to think what would happen if Evernote ever went out of business and I have all these personal clippings sitting out there in the Cloud which will just plain vanish unless some larger entity ends up owning them. I’d much rather Google provide me this sort of functionality — which it doesn’t, and Google Docs is no Evernote. But even as healthy Google is, there’s still no guarantee of permanence of this data. In all fairness to Google, you can “Liberate” your data at any time, and you’ll get it in neat VCF (vCard) and ICS (iCalendar) files, but good luck transitioning this data to something else in an easy fashion. The import won’t necessarily be as clean as you want or think it will be. One could certainly argue that you could lose or destroy a Day Runner with all your yellow stickies and scribbles just as easily, and the data loss would be catastrophic, but I’ll posit that you can photocopy your Day Runner and yellow stickies if you really wanted to, and understanding the structure of that data if you had to transcribe it to a new Day Runner or even another electronic organization system would be a lot easier. The bottom line is I have to learn multiple UIs to do all of this calendar and personal data management across my devices which use Google Calendar and/or Lotus Notes, which aren’t consistent, and don’t necessarily have all the same features across all platforms. So while I do think the Day Runner/Filofax folks who resist moving to electronic calendaring systems are at a disadvantage and are throwing all of their eggs into one basket, I certainly understand their desire to keep life simple and having settled into a routine that has continued to work for them for a long time. Electronic calendaring and personal organization, while a powerful tool, is absolutely not simple, and I think it can still be improved. A Lot. Maybe there’s something that can be learned from the Day Runner and Filofax luddites. Do you still use a Day Runner/Filofax or wish your electronic Calendaring/Organizational tools were better? Talk Back and Let Me Know.